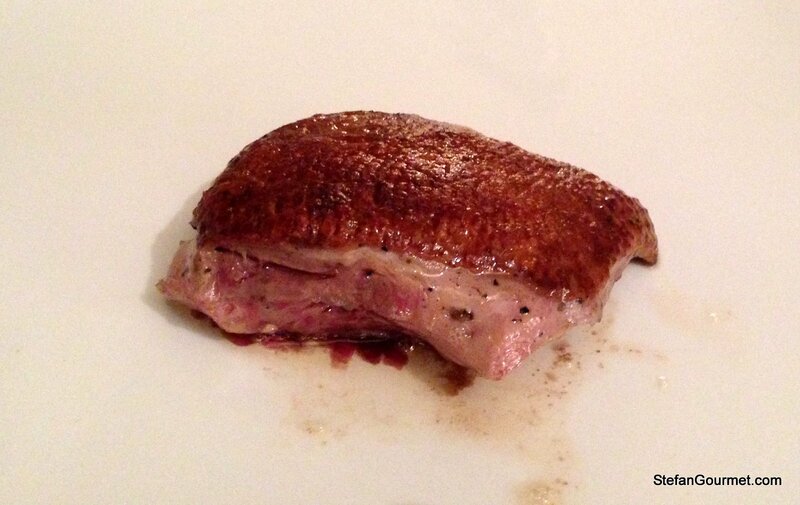 I always thought it was impossible to prepare a perfect duck breast. 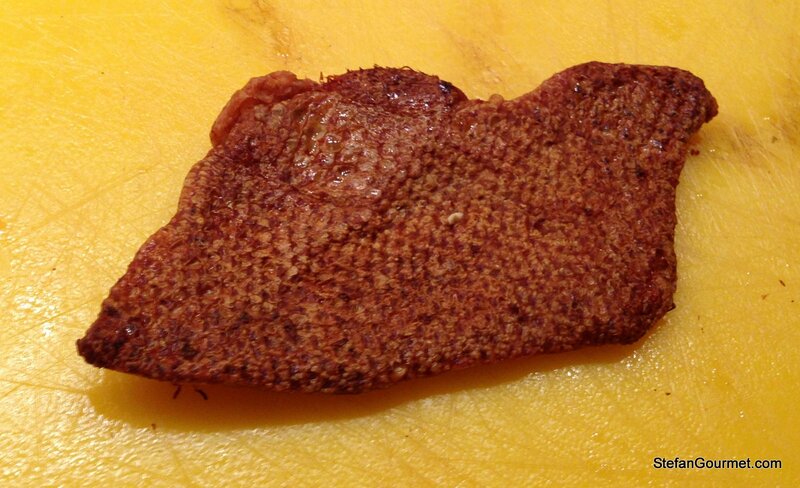 Duck breast consists of two parts: the skin and the meat. To be perfect, the skin should be crispy with most of the fat rendered out of it, and the meat should be medium rare. 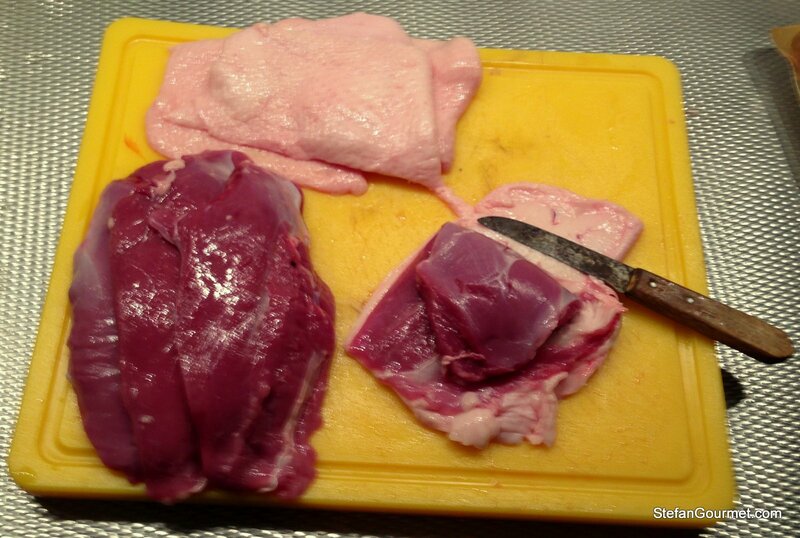 Both at the same time seemed to be impossible, as the meat overcooks while you are rendering the fat from the skin. Even experimenting didn’t help to solve this conundrum. Taking off the skin is not so hard with the help of a sharp knife. We cooked the skin in the oven between silicon mats. We put a lasagna dish with something heavy on top of the skin while it was cooking in the oven to keep it flat. We cooked it for 45 minutes at 200C/390F. The resulting skin was very crispy and had a nicely browned flavor. Next time I will try a lower temperature and a longer time to get the same crispness but less of the browned flavor as it was a bit strong. Using Activa RM is very easy: just make a slurry by mixing it with cold water in a 1 to 4 ratio (1 part Activa to 4 parts water) and use this slurry as ‘glue’. The sodium caseinate in the Activa RM helps to glue together parts that are difficult to glue, like cooked meat and skin as in this case. The only problem is that the skin shrinks a lot when cooked, in fact it ended up being less than half of the original size. This is why you see that the skin does not fit on the meat very well. We found a good solution for that though: cook the skin first. Trim the meat to fit the skin, and then glue the trimmings to the bottom of the meat. 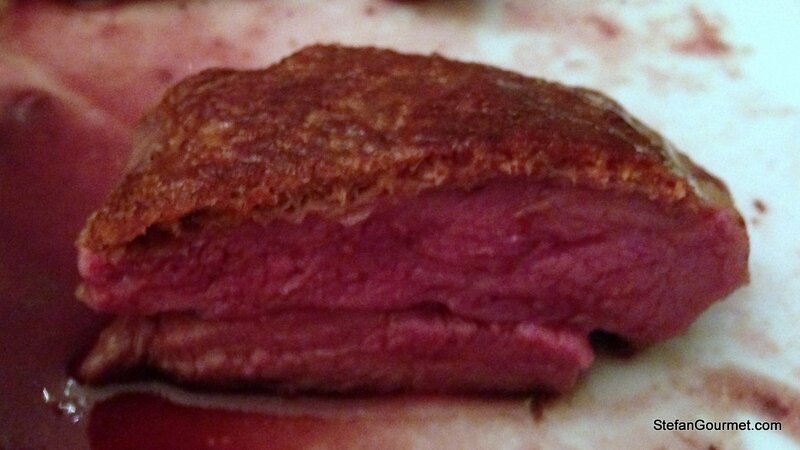 The resulting duck breast looks very ‘natural’ so this is how we will do it next time. The Activa will need 4 hours in the refrigerator or just 5 minutes at 55C/131F to set. 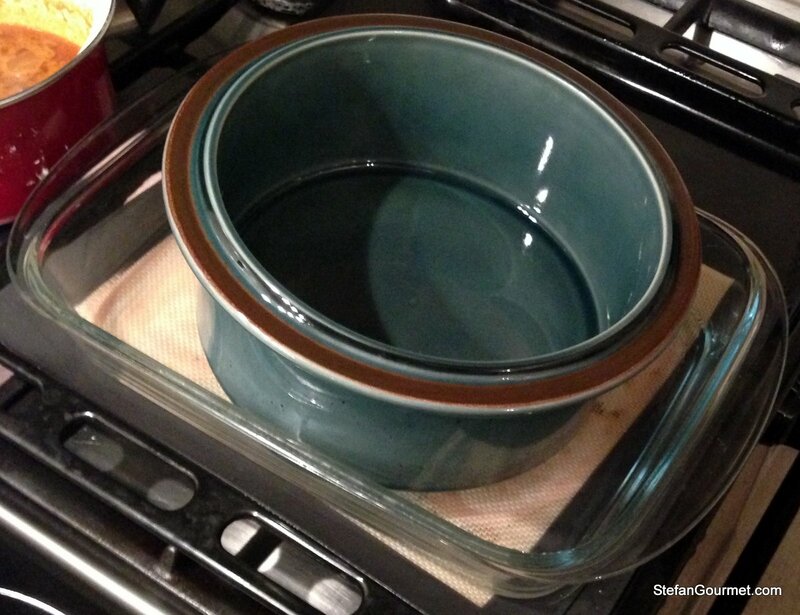 The parts you are trying to glue together should be pressed together tightly, so vacuum sealing is best. And if it is vacuum sealed and you have a sous-vide cooker, then cooking it at 55C/131F is very easy to do. We were not sure whether it would work to glue the skin to cooked meat, so we tried to glue it to cooked as well as raw meat. Both worked equally well. In both cases as a final step the meat is seared in the duck fat rendered from the skin over high heat to brown the meat and crisp up the skin because the skin becomes slightly soggy when cooked sous-vide. 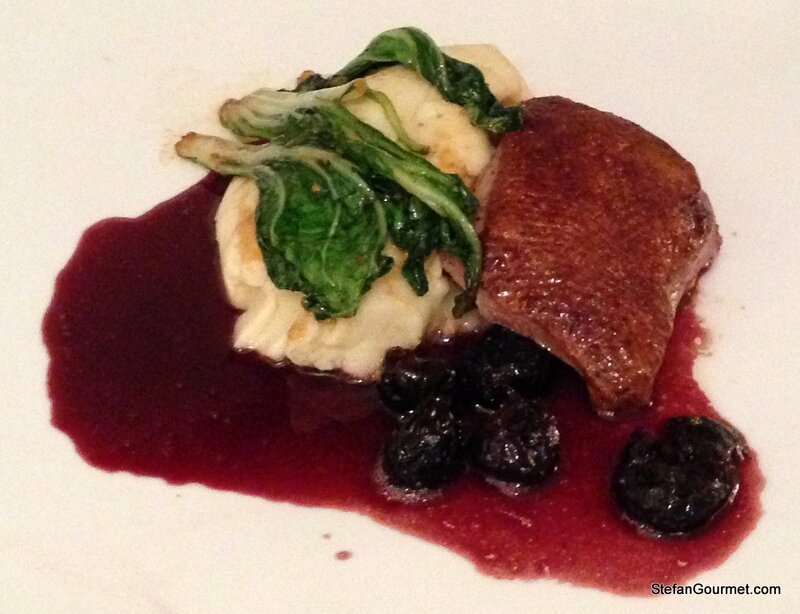 Teun came up with a port sauce with dried cherries, and sides of mashed potatoes and bok choy with garlic and soy sauce. This made for a very nice meal. I paired it with a Salice Salentino Riserva from Puglia in the far south of Italy, which was a good pairing as this wine has a hint of cherries and the duck can easily stand up to such a full-bodied wine. Click here to read more about Transglutaminase. There will be more posts using this very useful enzyme! I’m not a big fan of gimmicks on my plate, but in this case you can only tell in the finished dish that something special is going on because of the rare combination of crispy skin with medium rare meat. Otherwise it looks and tastes perfectly natural, and that’s how I like it. pretty clever. I haven’t used activa yet, but really want to play with it at some point. thanks for this interesting post! Sorry, I’m just not a fan of anything so unnatural. I find roasting the whole duck in the oven over a rack renders the fat beautifully and the meat is moist and delicious under crispy, glazed skin. I’ll do it the old fashioned way. activa is used in sausage making pretty extensively. Also activa is a natural enzyme as well, produced naturally by plants and animals. I know it sounds weird, but it isn’t all that weird really. I agree, Chef Mimi! Pretty incredible! Nice, Stefan. Thanks, Mimi. It was the first time I used this stuff and it won’t be the last. As always – you amaze us !!! Thanks, Richard. I’ll have to do a post with better pictures. I’ve cooked duck breast in a similar manner to this for some time now, but I simply present the duck skin as a separate ‘crisp’ on the plate and sear the duck breast very quickly for a more attractive colour. I like the idea of using the meat glue to present it in one piece though – do you really not lose any crispness in the skin even with the small additional time at 55C? The crispness that is lost by sealing and cooking the meat with the skin is restored by the quick sear at the end. That looks perfect! I am intrigued 🙂 I took the traditional approach, and indeed the meat is a little overcooked. I find it varies on the thickness of the flesh/amount of fat quite a bit, but occasionally I do get it medium-rare. I usually manage to get the meat side of the duck medium rare, but closer to the skin it is overcooked when done in the traditional way. You know I saw something similar on Masterchef in the UK. They took the skin off of a duck crown and they sous vide the skin for about 18 (maybe that’s too long, I really don’t remember) hours on a slow cook to render all the fat down, then they glued the skin back to the crown, then sous vide the whole thing again for awhile, then quickly seared the skin after it all came out. Then they carved the breasts off of the crown. Apparently it makes a really crispy skin and you don’t need to worry about shrinkage. It seemed like a lot of work for home, but not too crazy for a restaurant. Thanks for posting such great information. May I ask if the Transglutaminase will bind cooked meat with cooked skin? In your example I believe the cooked skin was glued to raw meat, I’d like both to be cooked. Also, how strict is the 5 minute at 131º binding process. If I was above or lower a few degrees would it still work. Hi John, thanks for stopping by. The Activa RM (same as Activa EB) will bind cooked meat with cooked skin. 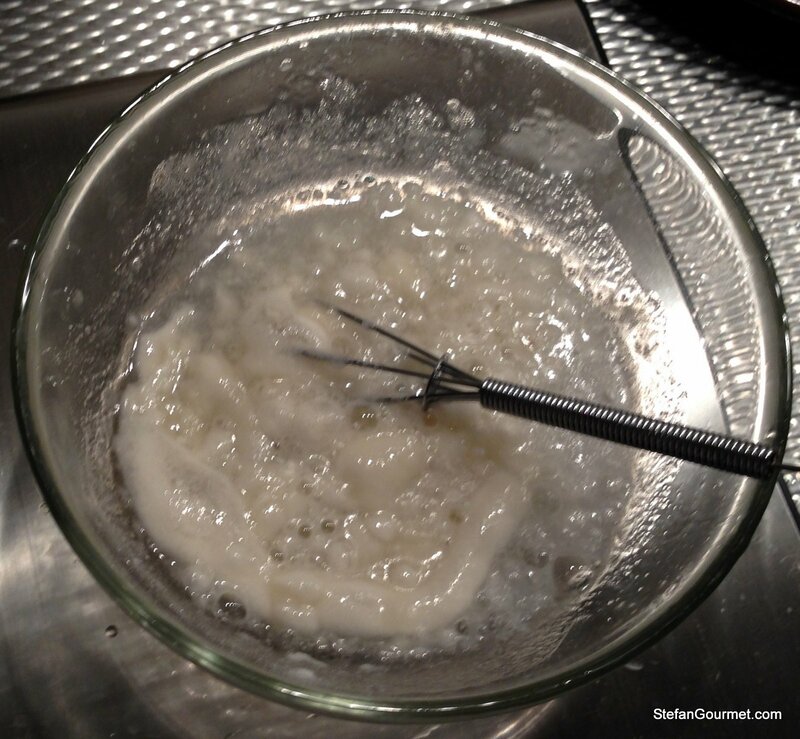 I tried both cooked skin to raw meat and cooked skin to cooked meat, and could not notice a difference. Activa RM is not pure transglutaminase, but also contains ‘helper proteins’ so that you can bind many different things. Lower than 131ºF is not a problem, but the binding will take longer. For example, 4 hours at refrigerator temperatures (compared to only 5 minutes at 131 degrees). A few degrees higher is not a problem either, but if you heat the transglutaminase above 60ºC/140ºF it will disintegrate. It is okay to heat it higher AFTER it has bound. Season, smoke lightly, s-v for 45m @55C. Score and brown both sides, the fat side a little longer. 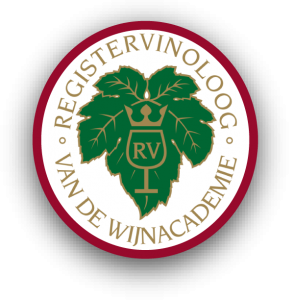 Deglaze with wine and orange juice and mount. What do you think? Sounds very nice! I must say though that my use of Activa in this recipe is not purely for presentation purposes. It is true that I could cook the meat and skin separately and serve them separately, but I like to eat them together and so the glue serves a real purpose. I suspect that in your preparation the skin is still quite thick. 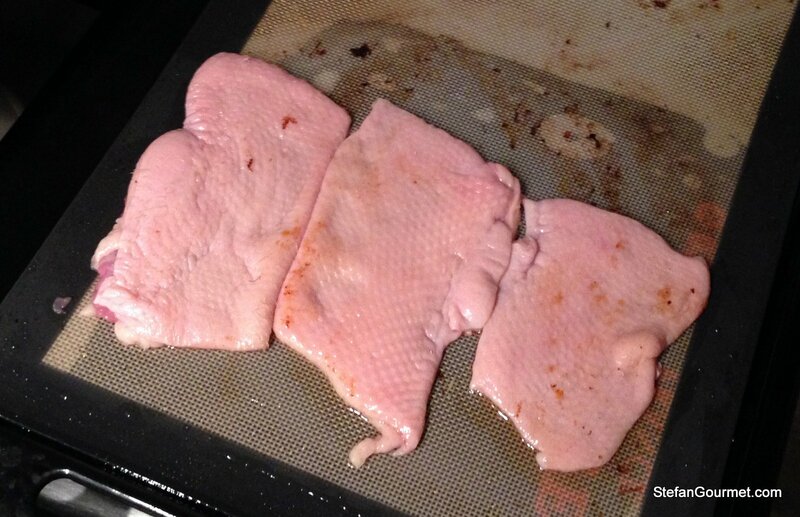 I prefer the skin to be thinner, and I have not found a better method than activa to serve duck with a thin crispy skin without overcooking the meat. 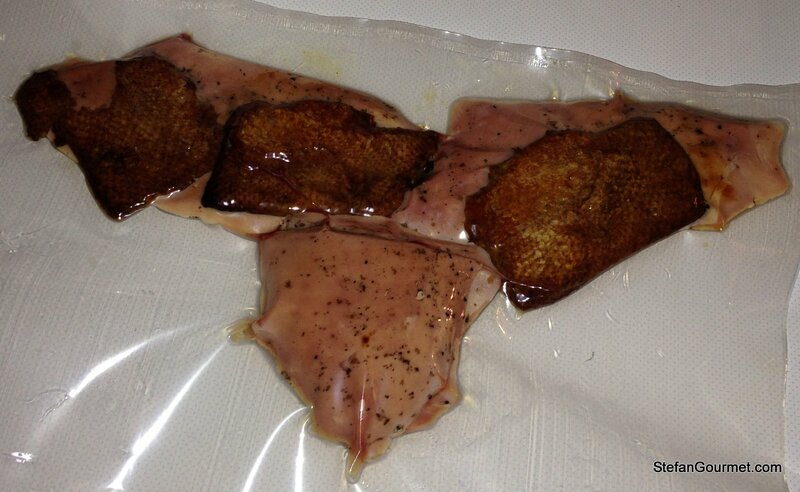 I haven’t tried a lightly smoked duck finished sous-vide yet, that sounds great! You use a hot smoker like I do, right? Aha now I understand the difference in our recipes. Indeed the skin is quite thick. However, if you score right down to the meat for me it is the perfect combination with the lean meat. I use a hot smoker just like you.